Juneyao Air is a part of the private Shanghai Juneyao Group, which is among the 100 biggest companies in China. Chinese airline Juneyao Air will make its move into European markets by opening a direct flight from Shanghai to Helsinki in summer 2019. Juneyao Air will operate the direct flights between Shanghai’s Pudong Airport and Helsinki with the new Boeing 787 Dreamliner aircraft. The airline has over 50 connections from Shanghai to other Chinese destinations. “Juneyao Air is a wonderful addition to Helsinki Airport and offers a comprehensive network of connections in China,” said Joni Sundelin, senior vice president at Finavia. Helsinki Airport’s connections to China will increase to 51 weekly direct flights with the announcements of Juneyao Air and Tibet Airlines, which is to open a new route between Jinan and Helsinki. The route will be operated once a week and is scheduled to begin in April 2019 with the Airbus 330. 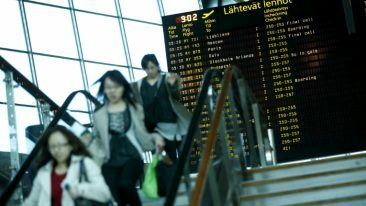 Finavia expects the new routes to further increase the number of Chinese travellers to Finland and offer more options between Finland and China, as well as other Asian destinations. Juneyao Air’s announcement comes on the heels of news that the Lake Saimaa region and St. Petersburg will collaborate to promote cross-border tourism between the two destinations, increasing options for Chinese travellers further.